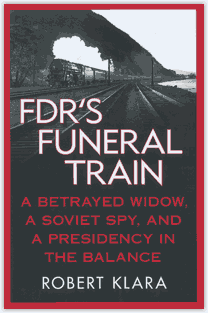 FDR’s Funeral Train: A Betrayed Widow, A Soviet Spy, and a Presidency in the Balance. The true story of the wartime train that took one dead president, one live one, and 140 of the most influential men of Washington on an adventure that has been shrouded in mystery—until now. The April 1945 journey of President Franklin D. Roosevelt’s funeral train became a thousand-mile odyssey fraught with heartbreak and scandal, with shady deals and the shadier men behind them. As it slipped through the night, chuffing its way from Warm Springs, Georgia, to Hyde Park, New York, few of the grieving onlookers at the trackside gave thought to what might be happening behind the Pullman shades, where women whispered and men tossed back highballs. A closer look inside, however, would reveal more than anyone imagined. There was Lauchlin Currie, a brilliant economic theorist and West Wing insider—and a man whose cover as a KGB operative would soon be blown. There was John Maragon, a coattail-rider and influence peddler with a violent temper, a rap sheet, and designs on the White House. There was Eleanor Roosevelt, doing her best to hide the secret she’d discovered only hours before: Her husband had died in the company of a mistress. There was Harry S. Truman, president for less than two days as he rode the train to Roosevelt’s burial in Hyde Park. He had 18 hours to learn the most intimate secrets of world’s most powerful office—and to write the most important speech of his life.